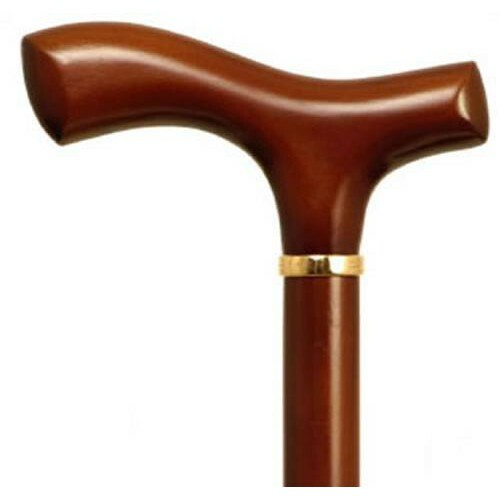 Mountain Properties Light Brown Beechwood Cane with Fritz Handle is made with a sturdy wood handle and shaft. It is ideal for those who experience difficulties due to arthritis. It features an 18mm rubber tip to prevent slipping and has a 250 lb maximum weight capacity. It is designed for comfort, support, and style. This Orthopedic cane is available in two sizes: women's - 36 inch L (with a slightly smaller handle) and Men's 37 inch L. The shaft is made from solid wood for high durability. 36 inches, according to the manufacturer. What is weight it will support? 250 Pounds according to the manufacturer. The cane I have received was made in Taiwan, not in Europe. The handle shape is slightly different from the pictured one. Also, the color is not the pictured chestnut, but yellowish brown. I would have preferred the pictured color and shape, but what I got is not bad either. Overall quality of the craftsmanship is great. The finish is smooth but not glossy, ideal for an object which is to be hold for extended time. One of the best canes I have handled so far, and the price makes it a great bargain. Highly recommend. A very comfortable cane to use. Its also much more rugged than another of my canes which cost 4-5x more. A very good buy and I would recommend it highly. 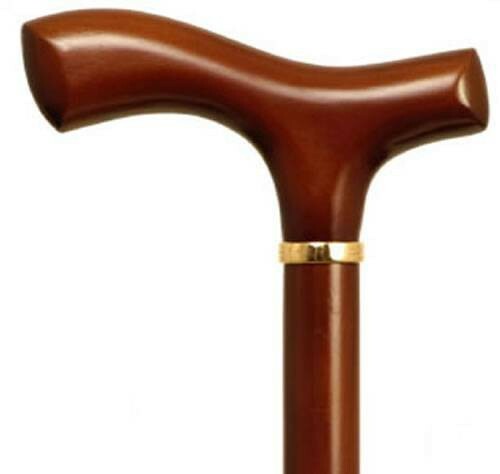 I would highly recommend this cane. It's a perfect and comfortable fit to the hand, well made and much more rugged than others that cost four times as much. Just received this cane a week ago or so and am totally pleased. I have another which was 3 times for expensive but this one is more rugged and comfortable. Perfect fit! I like your canes, because they fit my hand better than anything else I've tried. I regard the cane also as a personal defense weapon, and practice with it continually, to hit what I aim at!! In that process usually the handle starts getting very loose and eventually breaks off. Yet...I have to have a cane to walk!